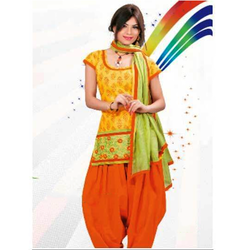 Pioneers in the industry, we offer designer patiala suits, patiala suit, patiala salwar kameez and patiala salwar suit from India. In order to comprehend and meet the diverse demands of clients, we are able to offer an extensive array of Designer Patiala Suits. 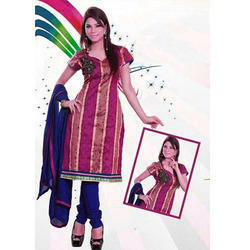 Owing to our proficiency in this sector, we are engaged in offering an array of Patiala Suit. These products are precisely designed by making use of supreme class basic material under the supervision of our skilled professional in order to meet the set international norms. In order to match the precise demand of customers, we offer these products in various colors, designs & sizes. Customers can avail these products in excellent packing material at nominal rates. Keeping track of latest market development we are actively engaged in offering an exclusive range of Patiala Salwar Kameez. The offered range is worn by office going ladies for attending parties, marriages, etc and can also be worn casually owning to its designer print and light weight. This range is designed with the help of finest quality fabric and advanced tools. We offer the entire range in various colours, lengths for our clients to choose from. In order to comprehend and meet the diverse demands of clients, we are able to offer an extensive array of Patiala Salwar Suit.